I would like to begin by announcing that Scott Miller has joined us as a senior consultant. Scott will work closely with our clients to provide the expertise required to evaluate and solve their solids flow problems. He will analyze flow properties test data produced by our testing laboratory, and write flow reports describing the parameters necessary to resolve flow problems. Scott will be also be actively involved in providing practical conceptual design recommendations to our clients. Scott is enthusiastic and excited about our approach to solving solids flow problems. He received his Bachelor of Science degree in mechanical engineering, with a minor in mathematics from Geneva College in Beaver Falls, PA. Scott recently worked as a plant engineer at major power generation facility in Pennsylvania, where he was integral in monitoring their anthracite waste CFB, planning outages, and providing solutions to typical coal handling problems. Scott will be working out of our laboratory building. His contact information is included at the end of this article. Now to the task at hand. Site visits are an integral part of our consulting work. As a matter of fact, I met Scott during a site visit to the power plant where was working. Typically, our projects first start with a telephone call or email when someone has a flow issue that requires our attention. We try to gather enough information to at least write a proposal for the work required to solve the flow problem(s). However, most of the time the information is limited such that more detail is required from drawings, photos, etc., in order to address the issues and provide solutions. More importantly, drawings and even photos do not present a complete picture of the problems. There are always constraints, as well, especially at old facilities that are not readily apparent from a drawing or photo. Sometimes in order to fully understand the limitations of the facility and provide practical design recommendations a site visit is required. Most site visits are similar in that they obviously require travel to the site. Invariably there is a safety session, and then a brief meeting with our client to summarize the issues. Then the work begins in earnest. Typically, a plant tour begins at the top of the facility and works its way down to the bottom to observe the entire process. Once we are at the top we are often asked to look into the silo through a manway of some sort. Sometimes you can see material flowing, but most of the time it is dusty, hot, etc. We work our way down the process highlighting areas such as the cylinder section. 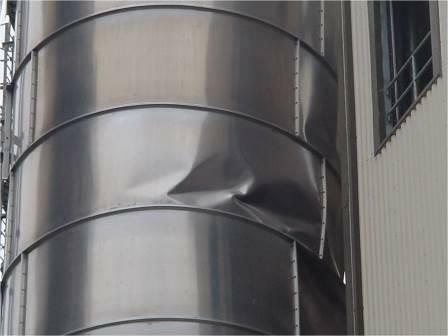 We look for any anomalies such as dents, broken welds, etc., that would indicate some sort of flow issue (see Photo 1). We then move to the hopper section where we determine the material of fabrication and measure the hopper angle and outlet size (see Photo 2). 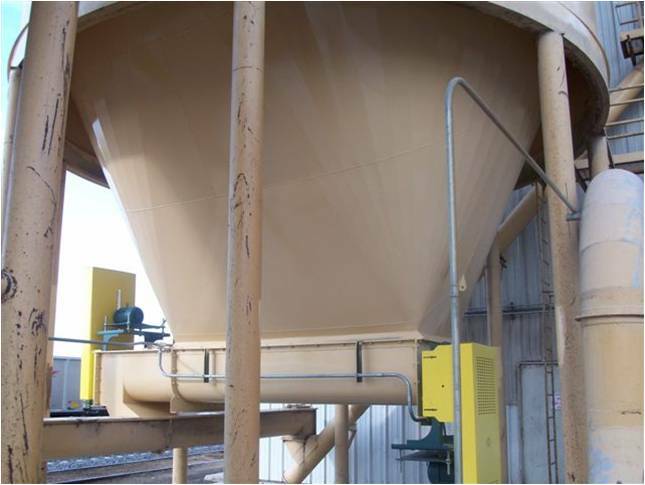 A feeder or gate is typically attached to the outlet to control discharge to a process, conveyor, blender, etc. Oftentimes, the feeder design is taken for granted. It is critical that the feeder work together with the hopper to ensure reliable flow. Gates always present a problem as sometimes they are used to regulate flow. Gates must be operated fully open or fully closed so as not to affect flow from the hopper. Sometimes material is transferred further on in the process that requires conveying (mechanical or pneumatic) and perhaps chutes or bucket elevators. Every area of the handling system has to be inspected in order to ensure uninterrupted flow to the process. After the site visit, a trip report is provided discussing the problems and findings during the visit and an action plan. This typically requires material flow properties testing to identify the flowability of the product being handled. Scott Miller can be reached at [email protected] or 803-517-0054.